A host of fun and thought-provoking activities are taking place in Southend to celebrate Fair Trade Fortnight. On Wednesday 4th March, Southend-on-Sea Borough Council’s Executive Councillor for Enterprise, Tourism and Regeneration, Councillor John Lamb will be trying out a ‘Smoothie Bike’ at Southend Civic Centre, Victoria Avenue, Southend. This is a sensational bike-powered smoothie blender – using Fair Trade ingredients of course! Meanwhile, Blenheim Primary School, in Blenheim Chase, Leigh, has enlisted a chef to teach the children Fairtrade recipes. Belfairs High School, in Highlands Boulevard, Leigh, is featuring displays and assemblies – including a film about Fairtrade Footballs. Milton Hall School in Salisbury Avenue, Westcliff, is holding a cake-making competition. All recipes will be collated and made into a Fairtrade recipe book. The school is also joining the banana eating world record attempt, and pupils will be dressing up in yellow on Friday 6th March. 2. The FAIRTRADE Mark guarantees that disadvantaged producers are getting a better deal. Today, more than 7.5 million people – farmers, workers and their families – across 59 developing countries benefit from the international Fairtrade system. 3. Journalists, photographers and broadcasters are invited to attend the following photocall. THE Southend-on-Sea & Leigh-on-Sea Fairtrade Network encourage the Borough to Go Bananas! For Fairtrade Fortnight. They are joining with other Fairtrade Networks across the UK to ask individuals, businesses, schools, churches, organisations in the borough to pledge to eat a Fairtrade banana between noon on Friday 6 and noon on Saturday 7 March to set a world record. Members of the Southend and Leigh-on-Sea steering groups will be taken part. Will your readers, organistations andbusinesses join them. The idea was formed by the Fairtrade Foundation who teamed up with ethical marketing agency Feel, to create a humorous rap animation that appeals to younger people. The animation, Rapping Bananas, will be featured across a range of social websites with seeding expertise from 7th Chamber. Targeted at 16 to 24 year olds, the short animation is being launched to encourage young people to take part in the Go Bananas for Fairtrade action this Fairtrade Fortnight (23 February – 8 March). The track used in the animation is Matt Helders’ remix of the Roots Manuva classic Again and Again and has been donated by the artists to support Fairtrade. Go Bananas for Fairtrade involves people pledging to eat a Fairtrade banana between noon on Friday 6 and noon on Saturday 7 March to set a world record. Over 90,000 people are already signed up and thousands of events are expected to take place across the UK. Giles Robertson, Interim Marketing Director at the Fairtrade Foundation said: “Feel have created a unique piece of entertainment that will appeal to young people. Our campaign, Go Bananas for Fairtrade, aims to highlight the straightforward support people can give to farmers and workers by choosing Fairtrade bananas. It’s the perfect fit for the finale of our Fairtrade Fortnight campaign when we hope to drive sales and encourage people to find out more about Fairtrade”. 1. The FAIRTRADE Mark is a certification mark and a registered trademark of Fairtrade Labelling Organisations International (FLO) of which the Fairtrade Foundation is the UK member. The Fairtrade Foundation is an independent certification body which licenses the use of the FAIRTRADE Mark on products which meet international Fairtrade standards. This independent consumer label is now recognised by 70% of UK consumers and appears on products as a guarantee that disadvantaged producers are getting a better deal. Today, more than 7.5 million people – farmers, workers and their families – across 59 developing countries benefit from the international Fairtrade system. 2. Over 4,500 products have been licensed to carry the FAIRTRADE Mark including coffee, tea, herbal teas, chocolate, cocoa, sugar, bananas, grapes, pineapples, mangoes, avocados, apples, pears, plums, grapefruit, lemons, oranges, satsumas, clementines, mandarins, lychees, coconuts, dried fruit, juices, smoothies, biscuits, cakes & snacks, honey, jams & preserves, chutney & sauces, rice, quinoa, herbs & spices, seeds, nuts & nut oil, wines, beers, rum, confectionary, muesli, cereal bars, yoghurt, ice-cream, flowers, sports balls, sugar body scrub and cotton products including clothing, homeware, cloth toys & cotton wool. 3. 7 in 10 households purchase Fairtrade goods, including an extra 2.3 million more households in the last year alone, helping Fairtrade sales reach an estimated half a billion pounds (approx £493m) in 2007, a 72% increase on the previous year. By the end of 2007 there were over 430 producer organisations selling to the UK and 632 certified producer groups globally, representing more than 1.5 million farmers and workers. 5. Roots Manuva will be performing in London in mid-February. 6. There are 57 certified producer groups in ten countries of Latin America, the Caribbean and West Africa supplying Fairtrade bananas to twenty countries in Europe, North America and Asia-Pacific. 7. Fairtrade minimum prices are calculated to at least cover average local costs of production - this price can be over double what producers would normally receive. 8. Fairtrade bananas were launched in 1994, and now one in four bananas sold in the UK is Fairtrade. 9. The banana is the most popular fruit in the world - people spend over £10 billion a year on the fruit globally. 10. While banana sales and demand soar, prices have plummeted, having a devastating effect on banana producers. In November 1997, bananas cost an average of £1.08 per kg in UK supermarkets. In June 2008 that price was as low as 50p per kg. 11. The majority of banana plantation workers do not earn enough to live and support their families – some earn less than £1 per day. The Southend Church Football League (SCFL), which was formed for the 2008-09 season, has recently purchased match-quality Fairtrade leather footballs for all league matches. The league currently features church teams from all across the area. To find out where you can purchase Fairtrade balls, visit the Fair Deal Trading at http://www.fairdealtrading.com/ Please also lobby your local sports shop to stock Fairtrade balls. We are hoping that Original Sports in Leigh will stock them - drop them an email at www.originalsports.co.uk to encourage them to stock them. check whether there is a producer partner visiting your area and get ideas for events you can organise from our action guides. Download these and other new resources, including our event guides, quizzes, web banners from here. Don't forget to promote your events through the online calendar on the Fairtrade Foundation website and keep an eye on the website to find details of how you can enter the Fairtrade Fortnight Awards to win a prize for your Fairtrade Church, Diocese or other grouping. Please also send any details of events to the Leigh and Southend campaign, details below. 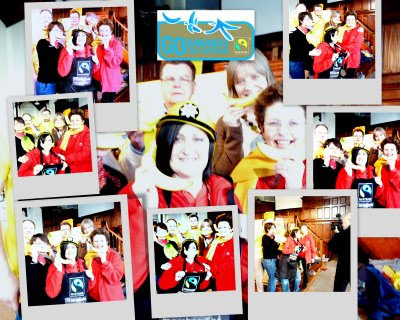 Get your church involved in the Go Bananas for Fairtrade event - helping us break the world record for the most people eating a Fairtrade banana over a 24 hour period. Read more about why Fairtrade bananas are important and register to take part here. Don't forget to order inflatable bananas, T-shirts and more to make your event a huge success. Did you know that your church can register to be an Official Fairtrade Church and receive a pack and certificates to help you promote and celebrate your achievement? Visit this link to find out more: Become a Fairtrade Church. There are also links to Worship resources and creative ideas to include Fairtrade in your church below. Since our last Church e-newsletter in the October 2008 it is exciting to hear that more churches in our area have registered with the Fairtrade Foundation. Great stuff. We know there are many more churches which use Fairtrade – just register with the Fairtrade Foundation and let us know too! Shhhh! NO Don't keep it quiet. If you have any events coming up where Fairtrade products will be served, used or sold – please let us know. We can help your church with promoting the event via our website www.leighfairtrade.org.uk just email info@fairtradeleigh.org.uk with your news and events. That goes for all of Southend too! Download the new worship resources from Traidcraft - and find out how Fairtrade is making it happen for mango farmers in India. Packed with prayers, reflections, sermon material, event ideas, children's activities, a PowerPoint presentation, and a DVD featuring the farmers' story, the pack has all you need to get your congregation really involved in Fairtrade Fortnight. You buy Fairtrade products, why not go one step further? We need to change the unfair trade rules that keep them in poverty. The European Union is now pushing for unfair trade deals with over 100 countries which will put big business above the interests of people in developing countries. Find out more and order briefings and postcards to ask the new EU trade commissioner to stop pushing unfair trade deals on poor countries here. As the screening is the result of a last minute change of schedule, it may not appear in media listings. Black Gold is an eye-opening expose of the multi-billion dollar coffee industry and traces one man's fight for a fair price. More info can be found at http://www.blackgold.channel4.com/ and the Film's website http://www.blackgoldmovie.com/. Please let your friends and those interested know. Leigh-on-Sea and Southend-on-Sea Fairtrade Campaigns will be present at the Good For Leigh Fair on Saturday 7th February 2009, 11-4pm at Leigh Community Centre, Elm Road, Leigh-on-Sea. There will also be details on Fairtrade and how you can get involved and support the campaign. It's an event not to be missed! Pop in and say hello.